The three year award started June 15, 2002. The award is for “Information Assurance for Energy Constrained Wireless Sensor Networks.” This area addresses the underlying science and technology survivable and secure communications and networks, information infrastructure protection, and survivable systems engineering. Its objectives are to provide secure, survivable, and assured communications over both the wired and wireless networks, including highly mobile networks. It is funded by the Computer and Information Sciences Division of ARO. 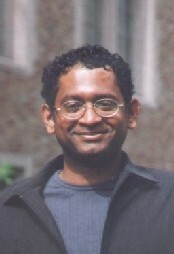 Radha is also the recipient of the NSF Career Award (2001) and the NSA Rising Star Award (1999). In addition, he is the 2002 recipient of both the Outstanding Research Advisor Award and the Outstanding Teaching Award of the UW EE Department.